The Bloodprint (2017. 437 pages) is the first book in The Khorasan Archives series of novel by Ausma Zehanat Khan. The book is essentially a fantasy quest novel, within which Khan has woven folk tales from her native land as well as a slice of contemporary geopolitical history. Ever since The Lord of the Rings fantasy readers have had a bit of a love affair with maps. In completely novel worlds these are often the best way for the reader to navigate between novel and fictitious places. 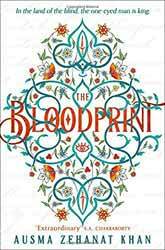 The Bloodprint contains a map which to all intents and purposes is a map of the Middle East. As far as can be known the book is not set in an alternative universe or a far flung history, but the author has taken land known to her to provide the backdrop to the story. With this in mind it is no great intellectual leap to realise that the main villains, the Talisman, are actually the Taliban. She paints her villains as cruel fanatics who enslave women, arbitrarily murder men and children and who find all forms of enlightened learning a threat to their power. My initial thought was that the author was going to use a fantasy novel to explore real world issues in much the same way science fiction has done for most of it history when in fact there is little exploration to the motives of the Talisman. They are introduced, we encounter a few lowly slave traders, but there is no in-depth critique of their basic belief system or how a wholly male dominated group justifies their treatment of women. The novel should really be termed fantasy romance as large swathes of the narrative visit and revisit, ad nauseam, the feeling that Arian secretly still holds for the Silver Mage and his not so hidden desires which lead him to fits of undignified jealousy anytime another male admires the First Oralist. A couple of references during the narrative would have been sufficient for me to get their relationship without having to bear witness to their cheerless navel gazing every time they get near each other. The book turns out to be little more than a travelogue of Arian's quest to find a fabled book which would give her the power to break the Talisman’s hold on power. She hopes that it will increase her mastery of the Claim, best thought of as the ‘Voice’ that the Frank Herbert’s Bene Gesserit used in his Dune novels. I say travelogue because none of the character appear to change or grow in response to their experiences, the Arian we see at the end of the book is little altered to the character introduced in the first chapter. I really did try to like the book but in the end it left me a little flat. Things which could have been explored were ignored. There is too much tell and not show leading to a lot of exposition in the dialogue, and even the ending was not a surprise given the amount of times the main character had revisited the same thought.